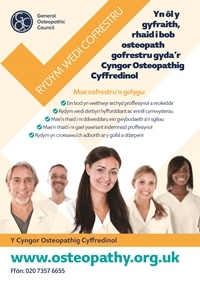 We produce information for the public, including leaflets such as 'What to expect from your osteopath', in English and Welsh. 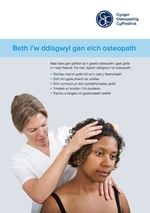 We also produce Welsh versions of the materials available to help osteopaths promote their registration. We provide other important information for the public in Welsh in our Welsh section, Cymraeg. Our Welsh Language Scheme sets out the services we provide in Welsh for patients and the public.